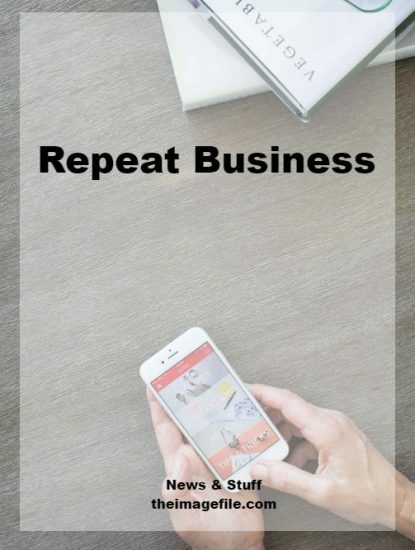 Repeat business is the bedrock of a successful business, whatever the field. It is a far smoother path to generating revenue than chasing after new customers. People who are already sold on your products and way of doing things make for great champions of your business. They’re your best marketing tool for new customers. Under promising and over delivering is a great combination to aim for with each customer. Cost effective. Going after completely new customers can be a thankless process. It’s expensive in time and marketing cost, with no guarantees either. Unfortunately, if you want to grow it’s essential though. Sometimes there is no specific reason for the failure, which can be disheartening. Using the existing customer base to promote new products can be almost free. The only commodities you are using is your time. Or the discounted cost of providing incentives for the existing customers to feel valued. A path to new customers. We have hit on this point before but your best chance of repeat business is word-of-mouth from happy customers. And it’s free! If you incentivise your existing clients correctly, they can spread the word for you but do not rely solely on their goodwill to be your foghorn. Offer them a discount on their next purchase with you for bringing people to your door, perhaps even an increasing level of value depending on their proactivity and success. Touch points. Remember special moments and days in your customers lives. They’ll remember this approach if it is not done in too-familiar-a-way. In other words, do not be creepy or over-communicate about it as this is a quick way to lose them. Clever systems allow you to schedule messages which can be broadcast at a set times in the year, i.e. a month before the wedding anniversary. It’ll bring in repeat business. Customer service. This is hugely important and should not be undervalued. Repeat business comes from excellent product allied with fond memories of the experience and delivery. Under promising and over delivering is a great combination to aim for with each customer. Going over and above, not to the detriment of your profits, will go a long way to rebooking that client and getting them to recommend you to others; remember word of mouth? For example, as an added bonus send them a personalised calendar with their order. An unexpected bonus which costs very little, which gives them a warm feeling that you care. Also it’s a constant reminder throughout the year of who you are, through subtle your branding on the calendar 😉 Don’t forget to contact them again in early December with an option of buying one. It’s a great stocking filler. Follow ups. This may not cost money but it is a skill that demands time and strategic planning. Overdo it, and you will run the risk of losing the business and relationship completely. Get it spot on and it is money for old rope. Trust your gut. Projects and relationships end, and most have a lifespan over which you cannot exert too much control. Being able to judge this and conserving your energy in the process will save you time, money and emotional investment. Don’t flog a dead horse!